Hello! Today I am bringing you a tutorial so I am really excited because I love doing these and to be honest I don't do them nearly enough. 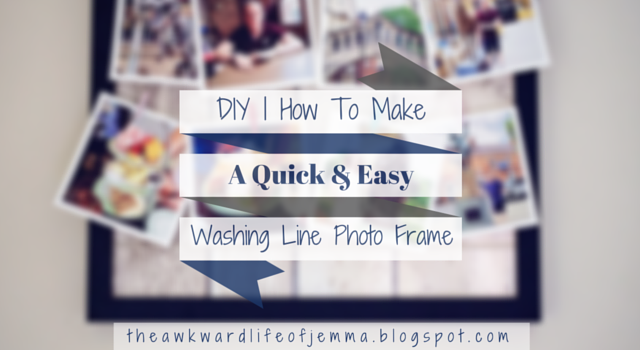 Now you've probably seen various guises of the 'washing line' photo frame popping up everywhere, from Pinterest to even some stores now, and I'll admit that I love them. 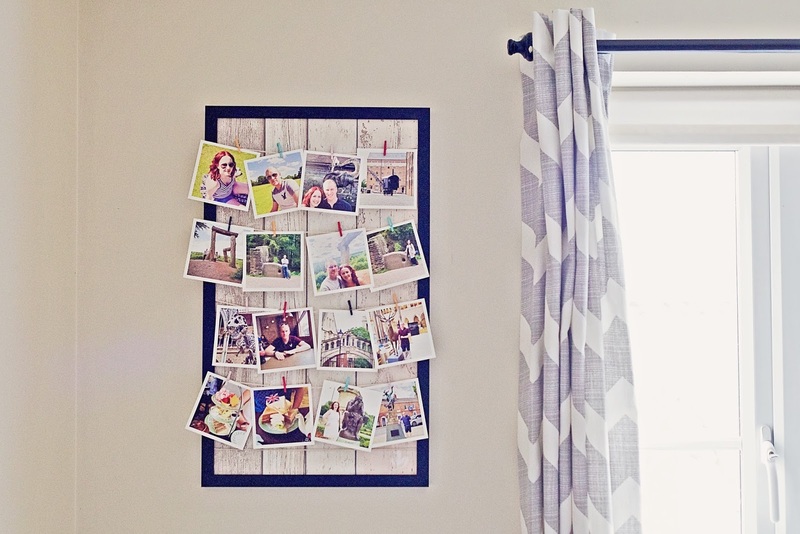 They are just quirky enough but somehow still stylish and they make it so easy to change your photos around or to display almost anything else you want. If you've got gig tickets and some photos from that night, you can hang them up. If you've got a favourite birthday card or some souvenirs from a holiday, you can hang them up. If you've got...ok you can see where I'm going with this, I'll stop! Despite this I bet that even though you think they are a great idea (which they are no doubt) that you haven't yet made one for yourself. 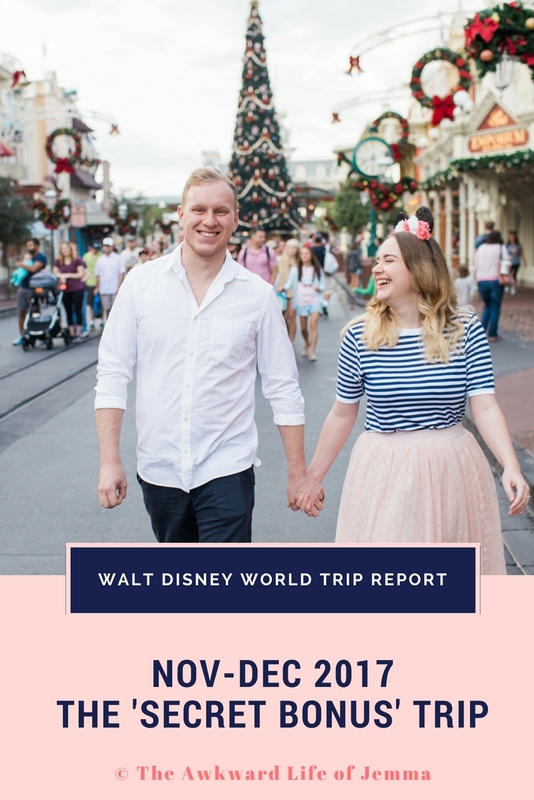 Well have no fear because I am going to show just how ridiculously easy they are to make and inspire you to do just that this weekend! Backing paper, Cut To Size (Again you can use whatever you like but this will depend on the size of your frame. If it's small you could use scrapbook paper, but for a big one like mine I used a wallpaper sample. 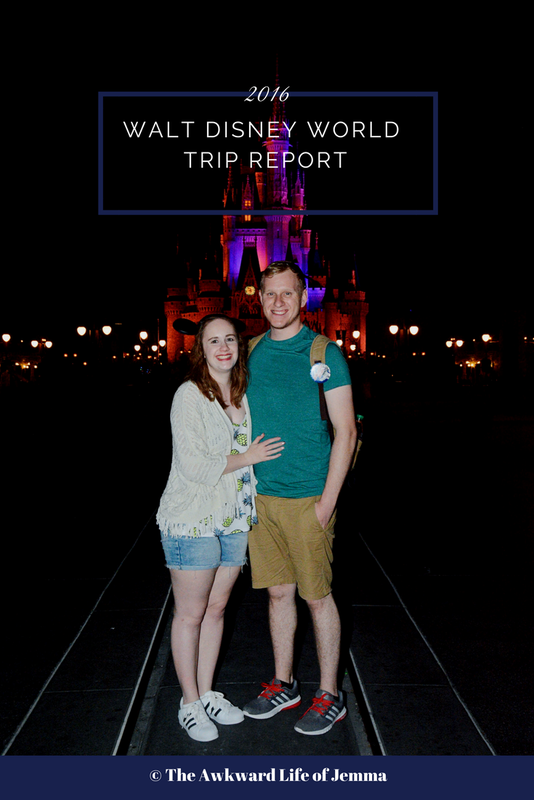 Make sure it won't be too distracting from your photos, it should serve as a nice background!). Mini Clothes Pegs (I bought mine on Amazon for £2.99 but anywhere that sells scrapbooking products will do them. Dovecraft do clamshell packages of lots of different colours, and I've even seen them in Sainsburys recently. Let's start with the string for the 'washing lines'. I used the grips on the back of my frame as markers to make sure every line was evenly placed but you can measure and use a pencil to mark on the frame exactly where you want the string to go. Place a small (approx. 1cm) piece of double sided tape on your marker and attach the loose end of your string to it. 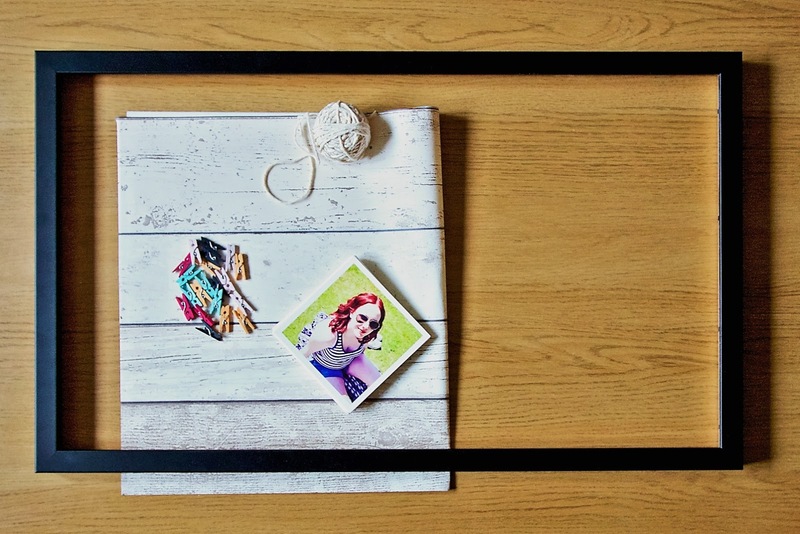 Unroll the string across the back of the frame until you reach the other side, making sure to keep it taught and allowing for a small section of string at the end so you can secure it inside the frame. Now cut the string and secure on the other side with another piece of tape. Repeat this step to create as many 'washing lines' as you desire. 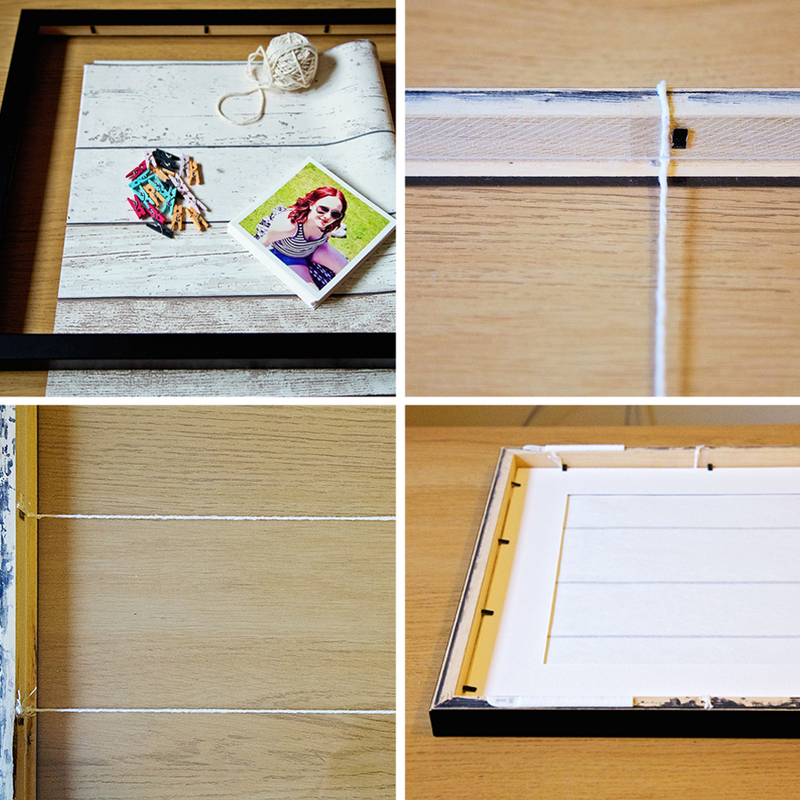 Now place your backing paper inside the frame and hold in place with your frame's mount or back board. Make sure the ends of your string are still secured in place and haven't moved, the backing will now prevent them from becoming unstuck. Close all of the grips on the back of the frame. Now you are ready to attach your pegs to your frame. Try to keep the pegs evenly spaced and be careful not to add too many as this will make your frame look cramped. 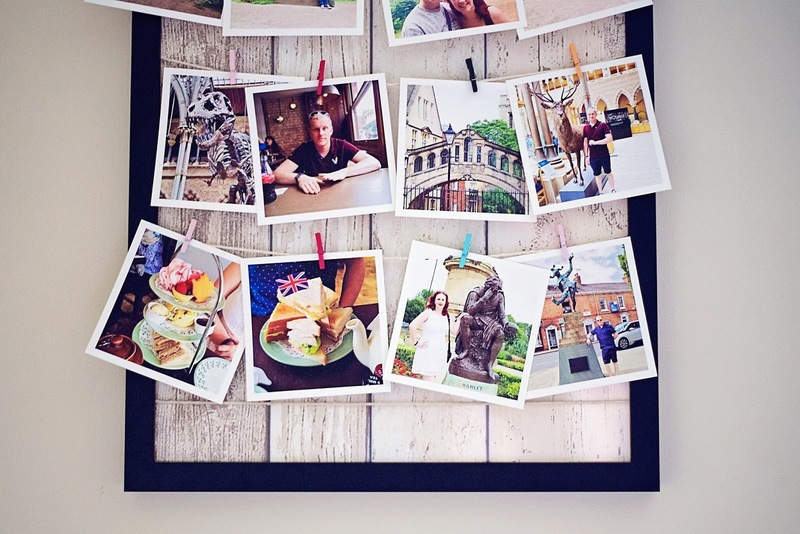 Use your pegs to add any photos or cards that you like but don't overfill the frame. Stop if it looks like your 'washing lines' are bowing as they aren't able to hold too much weight and overloading them will cause them to break! Finally you can hang your frame on the wall. I use Command strips for all the frames in my flat (and there are a lot!) as they are much easier to put up than hooks or screws and won't damage your walls at all, they are a little more expensive but great if you rent your home or are still living with your parents! As you can see I filled my frame with my Sticky 9 Instagram Prints from my holiday and various trips and I am so pleased with how they looked hung up in the frame. I also love that I can easily move them around and if I get any more photos printed later in the year, or next year, I can switch them out too. I really hope that I've inspired you to make one of these for yourself and if you'd like to get some prints of your own use the code - FRIENDVE8H to get 15% your first order at Sticky9.